Time to introduce a new a new face in the workshop. Connor Clark-Short is our new apprentice, he officially starts in September but has been working with us already for a trial period. He’s done really well and we are all looking forward to him starting properly. Connor has just left Thomas Hardye School in Dorchester after finishing his A levels. 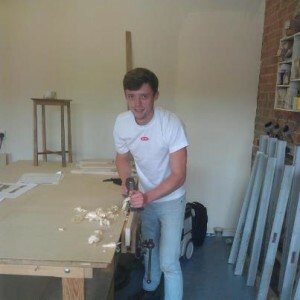 He has been provisionally accepted at Bath and Exeter Universities to study design but decided to come and train with us for a more hands-on learning experience. We had decided earlier in the year to look for an apprentice to train on a formal NVQ scheme and were busy contacting schools to see if they had potential candidates. If we could have written a brief for what we were looking for in an apprentice it would have basically been a lot like Connor. He actually took the initiative and contacted us with a really good CV and letter. 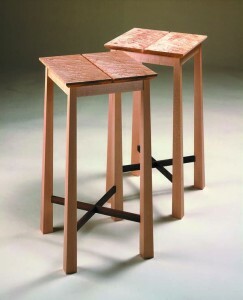 He’s got a really good attitude and is really eager to learn both the design and making aspects of furniture making. I’m hoping in a few months he’ll also be helping me out on the CAD side of things. As for Alice, who was with us for nearly 18 months renting bench space, she’s now doing her own thing and we wish her the best of luck.